Spleen started as a personal challenge. Patrick Wildt (patrick@) recently imported ssdfb(4), a driver for small OLED displays in OpenBSD and needed a 5x8 font to be able to squeeze more columns and rows on those devices. As someone spending most of his time in a terminal, I have been thinking about drawing my own font for a while, and this was the perfect opportunity. To be able to test character spacing and alignment, I started to use the font in xterm, then a zoomed version, and one thing leading to another, I started creating a 8x16 version, and then bigger versions based on it. Spleen is now available in 5 sizes: 5x8, 8x16, 12x24, 16x32, and 32x64. Fonts are provided in the Glyph Bitmap Distribution Format (BDF), and in the .dfont format for Macintosh users. All sizes contain all ISO/IEC 8859-1 characters, except for the 5x8 version which only contains printable ASCII characters. The fonts are available on GitHub, along with some instructions on how to install and use them. Looking ahead, my immediate plans are to continue improving glyphs themselves as well as characters spacing and alignment. This comes through extensive everyday use of the various font sizes. Another short term goal is to add support for Central European languages, with Polish being the immediate priority. 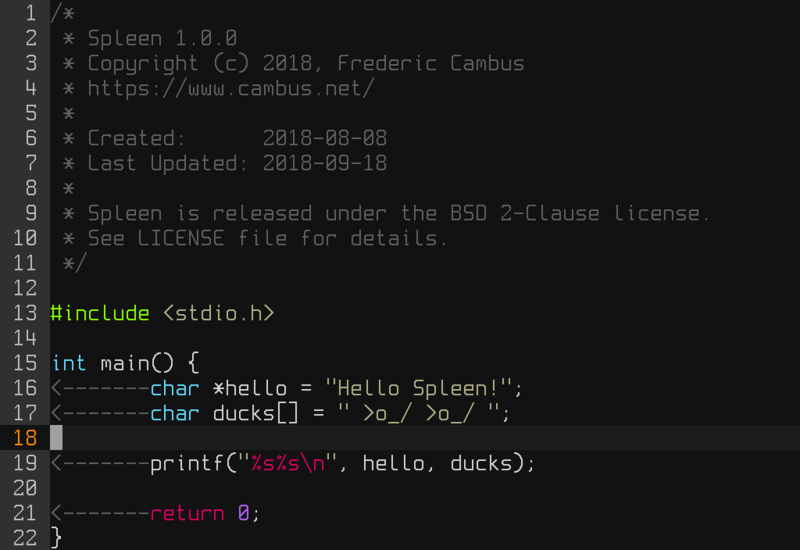 Meanwhile, I'm working on getting packages created for operating systems, and I just imported the OpenBSD port for Spleen this morning.